Material:birch plywood, metal screws, plastic cap. Dimensions: various. (L130 x B 130 x H 66 cm) Weight 11kg. Voltage:220v. Wattage: 10,4w. Lumen 800. Color temperature 2500. Includes filament LED. Lifetime 15000 hrs. The ’24mm Transformable chandelier ‘ is one of the products made with the ’24mm “system designed by Arend Groosman. The chandelier can be transformed into all kinds of shapes and forms, therefore the lamp is adaptable to your mood and you can shape it as you like. The ‘24mm’ system leads to endless creative possibilities when designing furniture. 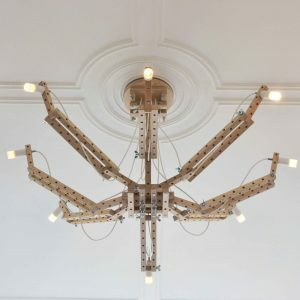 The ’24mm Transformable chandelier’ is made of birch plywood and LED lighting. All the products are handmade and produced with machines we built by ourselves in our local studio in Scheveningen in The Netherlands.